If you’re tired of glasses and contacts and the cleaning rituals they require, you may wish to consider vision correction surgery. With the surgical procedures available today, you can achieve excellent vision and say good-bye to glasses and contacts. Ophthalmologist Robert Maloney, M.D., understands what it’s like to have poor vision. He had poor vision from the time he was a teenager up until he underwent a LASIK procedure years later. Today, Dr. Maloney is one of the nation’s preeminent ophthalmologists. He has performed tens of thousands of vision correction surgeries. 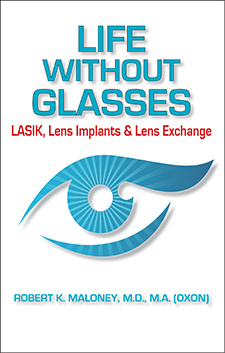 Now, in Life without Glasses, he discusses the newest developments in LASIK as well as a procedure called PRK, which is similar to LASIK. He also discusses implantable contract lenses, in which artificial lenses are implanted in front of the eye’s natural lens; he also explains refractive lens exchange, a procedure in which the eye’s natural lens is removed and replaced with a new, artificial lens. Are you a good candidate for vision correction surgery? How is the surgery performed? Is there postsurgical pain? How long does full recovery take? What are the side effects of a procedure? What are the potential complications of each procedure? Learn about the Newest Vision Correction Surgery Techniques!